When the hunters become the hunted, life for law enforcement officials and their families in Miramichi, New Brunswick, Canada, turns upside-down. It takes a months-long investigation by police, search and rescue dogs and their handlers to catch a suspected serial killer. Death Dealer is a gripping true crime story of committed investigators from two countries and their cooperation in the relentless pursuit of a brutal murderer. It’s intriguing from the moment David Tanasichuk reports his wife, Maria, missing. Explaining the ten-day delay in notifying authorities, David claims that he and Maria were having marital troubles and she had decided to take a break by leaving town. Suspense builds as lie after lie unravels. David’s reputation for violence and drug abuse makes investigators take his veiled threats against them seriously. Local police, frustrated by a fruitless wintertime search through miles of frozen wilderness, finally enlist the aid of Maine game wardens along with cadaver dogs and their dedicated volunteer handlers. This Law and Order meets CSI drama culminates in a riveting courtroom drama. 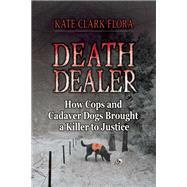 Kate Clark Flora is a former assistant attorney general for the State of Maine and the author of 12 books. An Edgar Award nominee for her true crime work, she has also been short-listed for the Derringer Award and a finalist for the Maine Literary Awards. She is the past president of Sisters in Crime, an international organization for mystery writers, the cofounder and former editor of Level Best Books, a cooperative dedicated to publishing anthologies of the best crime stories by New England writers, and the organizer of the popular blog, MaineCrimeWriters.com. Kate divides her time between her homes in Maine and Boston, where she teaches writing at Grubb Street, an independent center for creative writing.